Sewing has been slow with my injured hand. It is getting better though and I'm looking forward to getting the splint off soon so I can get my finger and my whole hand exercising and back to normal function. Eventually. 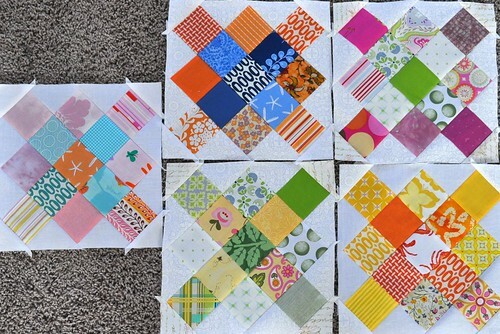 Five more granny square blocks. I have 4 more to make and I haven't used any purple yet! I'm planning on cutting purple squares today. I decided to just make the opposites of the first three blocks. 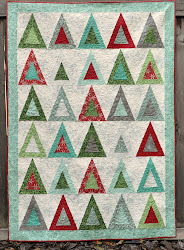 So this quilt may end up less scrappy looking than some of my others but that's ok. I'm looking forward to making more of these blocks, but planning on finishing my granny square top first. Love the blocks, especially the granny square. Pretty soon you'll get that splint off and it will all be just a memory!